Diabetes, a disease that affects the body’s ability to make insulin, affects nearly 8% of theU.S.population and ranks in the top 10 for leading causes of death. Type-1 diabetes usually develops in the childhood and teenage years while Type-2 diabetes often develops later in life. It costs billions of dollars each year in treatment and related costs. The average diabetic spends 2.3 times more on medical expenditures than the average person. There have been many advances in recent years for the treatment of diabetes. Glucose meters, insulin pumps and medications have definitely helped doctors and patients improve their quality of life and take better care of themselves. But, we are still looking for a cure and many promising research projects have demonstrated that we may be getting closer all the time. 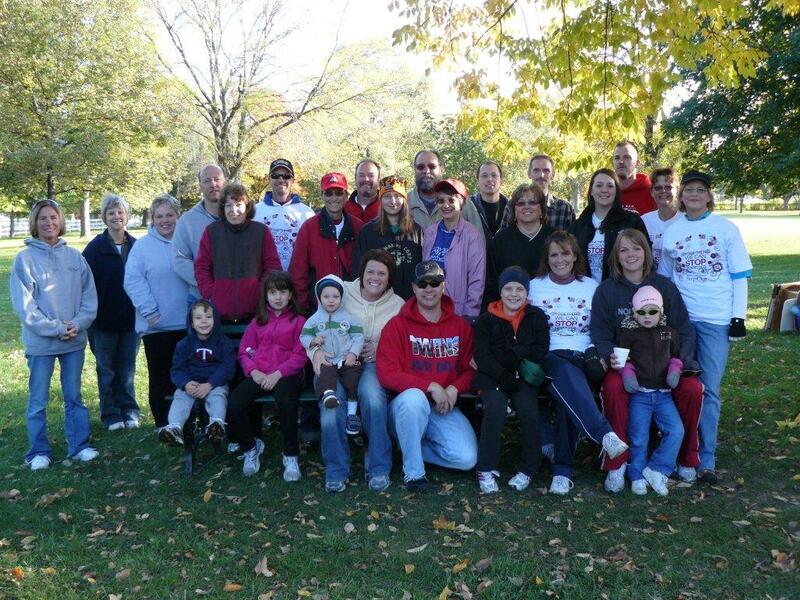 2011 marks the 11th year the Joe Walkers team has participated in the Mankato Walk for Diabetes. The walk, sponsored by the American Diabetes Association, raises funds for research to find a cure and for diabetes education. My family has three members battling the disease, myself, son Matthew and daughter Randi. Because of the way that diabetes affects our family, our son, Mike, organized the Joe Walkers team in 2001 to help raise funds to support research. The Joe Walkers team is named to honor Mike’s uncle Joe who passed away at age 39 from complications of diabetes. Other employees of Citizens BankMinnesota affected by this disease have also joined the team along with many friends and family members. Including 2011, our team has raised close to $50,000.00 through pledges and fundraisers. Together with similar walk teams acrossAmerica, we are raising millions of dollars each year to make a difference and find a cure. We would encourage everyone, whether affected by this disease or not, to find out more about diabetes, the promising research that is being done and to help support the search for a cure. More information can be found at www.diabetes.org. “In the darkness shines the light of an angel”, said one Soldier. Citizens Bank Minnesota employees decided we wanted to do something to make a difference, so on December 10, 2009 Citizens teamed up with Operation Minnesota Nice and sent our first packages to our newly adopted Soldiers/Marines who are overseas. This is not a matter of whether you believe we are overseas for the right reasons, but a matter of supporting our Military that have received their Orders and have been called to duty. Many of the men and women we have adopted hadn’t received so much as a letter from home. For them to know that someone back here cares about them makes a difference in their lives and makes their days a little bit brighter. There are days these men/women go without a meal from their Mess Hall. Snacks are sent to help provide a little nutrition or help tie them over. Out in the field, they wear holes in their socks in a matter of days. We send them new socks, as they don’t have a retail store to purchase new ones. They may go for weeks without a shower. Sending wet wipes and Q-Tips helps them stay somewhat clean. Many of our Military are overseas for the holidays. We send them Holidays in a box. As of April 4th, 2011 our employees have sent a total of 209 packages to 43 adopted Military personal (totaling 2,359 pounds of hope). Currently we are sending packages to 11 Military personal every month until they come home. Right now, the cost of shipping is $12.95 per package. The cost of a Thank You…Priceless. If you would like to make a difference in a Soldier/Marine’s life, donations are being accepted at any of our Citizens Bank Minnesota locations. Make a difference today! We’ve all experienced it…the aroma of oven roasted turkey wafting through the open door, the sight of enticing mashed potatoes slathered with grandma’s blue ribbon gravy. And don’t forget the accompanying brightly colored vegetable favorites neatly heaped to cover every visible fragment of plate beneath the inviting festival of tantalizing flavors. Or maybe for you it’s the zesty aroma of thick-layered lasagna and the accompanying basil & garlic fragrance to tantalize your taste buds. Whatever your favorites, whatever your most enticing menu items, our local Meals on Wheels volunteers load up & deliver these and other tasty and nutritious meals to nearly 100 senior or special needs citizens all around New Ulm. With the generous funding efforts of the United Way, Kraft, 3M, and others, the Lutheran Social Services Senior Nutrition Program has worked tirelessly to provide a wide variety of these nutritious tidbits, and here at Citizens Bank Minnesota, we’ve teamed up with other New Ulm volunteers to deliver those nutritious meals to the shut-ins who are depending on them. Once the lunch bug hits and one of our 20 volunteers opens the door of the New Ulm Community Center, the aromas tickle the sensations as the piping hot meals are wrapped and boxed into coolers to keep them warm inMinnesota’s frigid winter temperatures. But whether we deliver in -30° F or in 90° F, the results are always the same: Smiles and greetings, thankful recipients, and warm and satisfied stomachs! Many THANKS to all of our generous community volunteers!